– Nathanial Gronewold, “States Refuse to Back Down on Climate Policy,” E&E News, May 24, 2010 (reprinted below). Affordable energy is under assault at all levels of government. But while much attention has focused on federal efforts that are certain to increase the cost of energy (e.g. Waxman-Markey, Kerry-Graham-Lieberman) far less scrutiny been paid to the concerted efforts at the state level to achieve similar goals. The Institute for Energy Research’s report Energy Regulations in the States: A Wake-up Call fills the void and highlights the programs anti-energy activists are promoting in the states. The report is available here and an interactive map showing electricity prices and other select economic and energy data is here. A detailed look at greenhouse gas (GHG) regulations in the states. 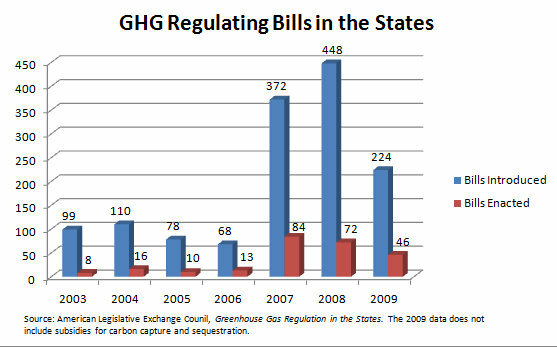 There have been total of 249 bills passed (see below) that regulate GHGs nationwide, leading to higher energy prices in states. An examination of the three regional greenhouse gas initiatives and their effect on state energy policy. A majority of the nation’s states are either members or observers in one or more of these initiatives, and they have varying effects of energy policy. A look at the de facto bans on coal power plants that are popping up in different parts of the nations, and the impact these have on the price of energy and doing business in these states. An analysis of Renewable Portfolio Standards throughout the nation. These mandates require a certain percentages of the state’s overall electricity to come from renewables. States that have binding renewable electricity mandates, have electricity prices that are an average of 40 percent higher than other states. A break down of the electricity generation profile in each state (this map provides an easy-to-use view of this breakdown). The report also explains why promoting nuclear and wind will do nothing to reduce oil imports (petroleum provides only one percent of our electricity generation). An examination of the reasons electricity prices are lower in some states than in others. For example, 13 of the 15 states with the least expensive residential electricity prices produce at least 50 percent of their electricity from either coal or hydroelectric power. A detailed state specific appendix examining the energy sources, prices, and regulation (scroll down here to view the link for each states) These profiles give the varying prices of energy per state, as well delve into the wide spectrum of energy sources utilized by our nation. They describe both the benefits and impediments that different sources face in each state and the programs that make up policy. 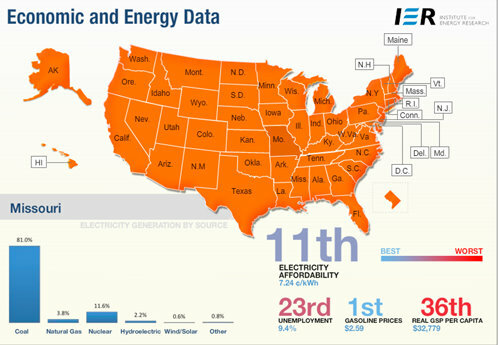 The map below shows energy sources and prices per state in comparison to the rest of the nation. Such data is a starting point for reviewing and understanding energy policy state-by-state with an eye towards free-market reform to put consumers in charge of their energy future. The Institute for Energy Research report emphasized that wind is an intermittent source of electricity producing only about 25% of their rated capacity and backing them up with gas and a massively re-wired national grid will likely double their real cost; however the assertion that “coal-fired power plants [are less expensive] than . . . natural gas, nuclear, or any of the renewable sources” is only true of pulverized coal in coal producing states like WY & WV, and is certainly not true of hydro in the Pacific Northwest (IER’s own data show that WA’s 70% & ID’s nearly 80% hydro to be even cheaper than WV’s >95% mine-mouth coal) . A levelized emissions playing field will render future coal IGCC more expensive than the up-front capital costs of NOAK fission reactors (present 2nd gen reactor fleet O&M+fuel cost average <2 cents) which should be even less expensive than a new traditional coal power plant (which actually require more materal inputs than new 3rd gen nuclear), even in coal states. What's more, to the extent fission can displace base-load use of natural gas fired electricity, a vary cheap, clean, and increasingly domestic fuel source for duel-fuel capable NGVs becomes available to displace petroleum imports. Present North American production of natural gas could cut petroleum imports in half if demand for gas-fired electricity is reduced (cut in half) by both fission and IGCC coal; and ground-source heat pumps continue to displace natural gas as an even cleaner and more efficient means of domestic space heating.